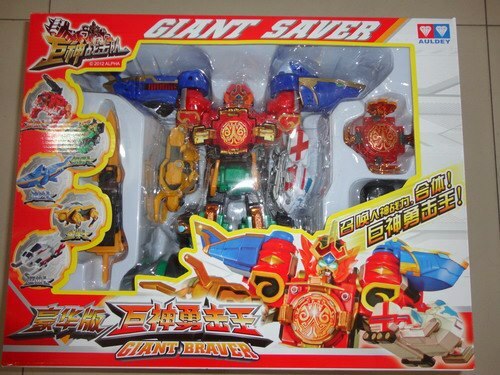 Have you been keeping up with the Chinese pseudo-sentai Giant Savers (Jushen ZhanJiDui)? If you have then you know this show has actually been in production since roughly this time in 2010! So far there’s only been a handful of promo videos for it and some grainy looks at the mecha. Well today, courtesy of Jefusions’ facebook page, we’ve been given our first look at the toy of the Giant Savers main mecha, Giant Braver! This single in box shot doesn’t give us a lot to go on but it certainly looks like it could be a great toy. In addition to this a recent Taobao auction also gives us our first look at the 2 other mecha from the series. Assault Saver and Crack Saver! 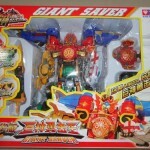 Have you been keeping up with the Chinese pseudo-sentai Giant Savers (Jushen ZhanJiDui)? If you have then you know this show has actually been in production since roughly this time in 2010! So far there's only been a handful of promo videos for it and some grainy looks at the mecha. Well today, courtesy of Jefusions' facebook page, we've been given our first look at the toy of the Giant Savers main mecha, Giant Braver! This single in box shot doesn't give us a lot to go on but it certainly looks like it could be a great toy. So the white "zord" is a snowmobile while the rest are animals? Okay, that's weird. That will take getting used to.. without giggling like an idiot. But! Still very much love it. Ha! I only just noticed that. I think white and green are animal/vehicle hybrids.Like white is probably a seal(sliding on the ice and all),and green i think is an elephant/tank.have to go watch the vids again and see if i can tell. Dude it's a toy based on a chinese knockoff of a Japanese TV franchise. Was anything other than KO ever an option?